Mammograms are helpful at finding breast cancer in women who have already had the disease, but aren’t as accurate as in those who have no history of it, according to new research. Scientists from Seattle found that there were more second cases of breast cancer detected in between mammograms, as well as more false positive test results, in women with a history of the disease compared with those who had never gotten a malignant breast tumor in the past. The researchers analyzed results of almost 60,000 mammograms for nearly 20,000 women with early-stage breast cancer over a 12-year period, according to HealthDay. 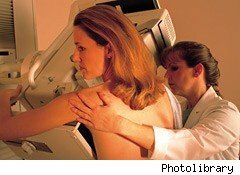 They compared it with the same number of mammograms for more than 55,000 women with no history of the disease. Risk factors like age and breast density were taken into account, said the authors of study, published Wednesday in the Journal of the American Medical Association. In the year after their screening, 655 incidences of cancer showed up in women who’d had the disease before, while 342 cancers were discovered in those who hadn’t, the researchers said. More specifically, the mammograms found about 77 percent of the breast cancers in patients who’d never had it versus 65 percent of the tumors in those who had. Only 1 percent of women without a history of breast cancer had a false positive test, while nearly 2 percent of those with a history had a false positive screening, the study showed. As for the likelihood of “interval cancer” — tumors that crop up between mammogram screenings — the rate was 3.6 per 1,000 for those who’d previously had breast cancer compared with 1.4 per 1,000 in those who’d never had the illness. She said the findings emphasize the importance of getting regular screenings after breast cancer is treated and going to the doctor right away if anything seems amiss. Dr. William Audeh, a breast cancer risk specialist at Cedars-Sinai Medical Center in Los Angeles who wasn’t involved in the study, said cancer radiation and surgery can cause a woman’s breasts to change. “That helps explain the false positives,” he told HealthDay. Robert Smith, director of cancer screening for the American Cancer Society, said that though mammograms aren’t infallible, they are still very good at finding breast tumors. “Despite poorer performance compared with women without a prior history of breast cancer, overall screening mammography was effective at detecting the majority of breast cancer in women with a [history] at an early favorable stage,” he told HealthDay.